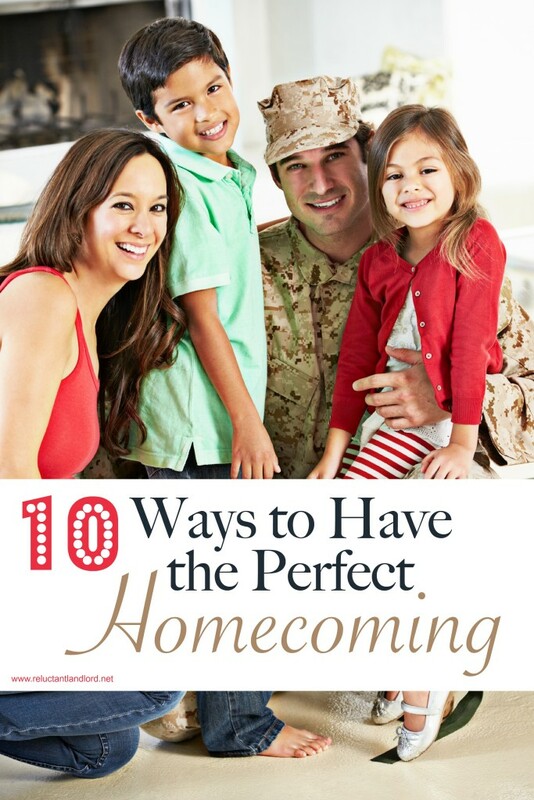 If you are anything like me, you have been dreaming about homecoming since the day your spouse left. That wonderful day where you get to run into his arms like all the movies and all the pictures you see. After 10 months of being apart and this being our first homecoming, I had stars in my eyes and no ground in reality. Our homecoming was amazing and wonderful, but it was also messy and crazy and although the Navy showed up on schedule, nothing went right. I was a novice wife who literally had no idea what she was doing. I didn’t go to all the meetings because of work duties, and I made every mistake in the book. Don’t follow my mistakes, here 10 ways to get your perfect homecoming! 1. Murphy Doesn’t Stop Homecoming Day. Be realistic with your expectations and understand that things won’t go perfectly, even on the morning of your “big day.” Not only was my welcome home banner hanging off one nail when we got home, but also my tire was flat because it had a nail in it. Murphy paid me a nice visit. 2. Take the Day Before Homecoming Off. I was recently talking to a senior wife who had done this a few times. She said she always took the day off before her husband got home. After working up until 7:00 pm the night before I totally concur with her wisdom. You will always have lots of errands the last day so just make sure you have enough time to get everything done. 3. Book a Photographer ASAP! Great Photographers book up fast! I remembered seven months ahead of time and got luckyy to find a photographer. Many photographers book up the minute people get re-deployment leave, so find one ASAP. You might be unhappy with just your phone photos. 4. Start Looking for “The Dress” as Soon as He Leaves. I had this grand idea of what I wanted from day one and yet I didn’t want to be that wife who had her dress picked out since month two. But, next time I will be that wife because the last month or two is crazy. So get as much time as you can get done ahead of time. Otherwise you will be like me the night before sending pictures to friends to figure out what to wear. 5. Lay Your Clothes Out a Few Days Before. This is similar to the reason above, but it’s helpful because this might be the only way you realize that your favorite shoes can’t be use because you ruined the heel before it’s too late! 6. Book Any Beauty Appointments the Week Before. I totally confess:I was that person who was painting her toenails in the car as we drove to pick my husband up. Don’t follow my example! Remember: you are going to be on your feet ALL day. Of course my amazing shoes that I could walk in for hours, were ruined, so now I was running around in shoes that literally made my feet bleed. Fail. 8. Take Time for Yourself. The week before your spouse gets home is beyond stressful. You’re going to be busy and stressed out. A great thing happened though, a good friend came over, got my very tipsy and then pushed me into our pool, clothes and all! Make a point to get everything done ahead of time so you can goof off and have fun. 9. Have All Vendors Booked Ahead of Time. I was that wife who was still getting her lawn mowed the night before and person who was supposed to clean my house, bailed the day of. A little planning on my part would have been much better. 10. Friends Are Going to Bounce Around. If your spouse deployed with an entire unit there will be a whole bunch of people coming in. There is a good chance your friends will be welcoming home spouses too, so expect there to be a lot of excitement and a lot of people to bouncing around! Just remember: at the end of the day something may go wrong. You might not be able to find the hanger, a the flight may be delayed, etc. Just breathe and I promise before you know it, you will be running into his arms. What are your Homecoming tips?